A stiffening or power capacitor is a great addition to any stereo system. Sometimes however the installation instructions for these devices tend to be lacking in description and can cause a bit of confusion. Let’s straighten things out and make “pre-charging” your capacitor as painless as possible. There are often two terminals on a capacitor, one positive and one negative. Unless otherwise specified, the power terminal of the capacitor will be placed in line with the amplifiers power cable. The negative or ground terminal on the capacitor will go to chassis ground, not the amplifiers ground. Try to get the capacitor as close to the amplifier as possible, a few feet is acceptable, this minimizes any performance loss due to the cable distance. Step 1) Remove the fuse for your audio system that connects it to your battery. This fuse is often in-line with the power wire of the amplifier that your capacitor is going to be connected too. Step 2) Wire up your capacitor by following all the instructions in the installation manual or refer to our “How to Install Car Audio Capacitors” knowledge base. 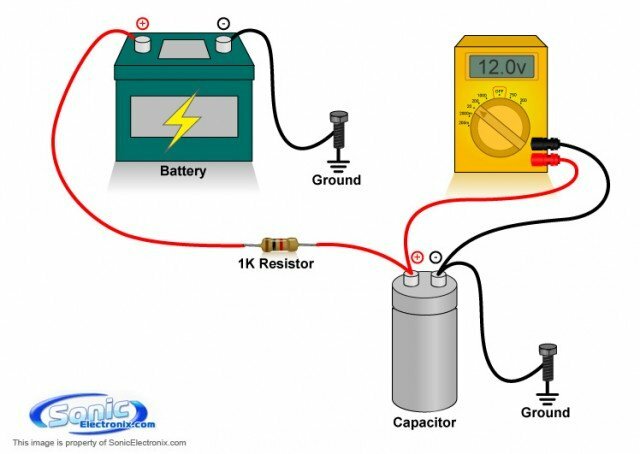 Make sure the power, ground and if applicable the remote turn on wire of the capacitor is connected. Step 3) To begin charging the capacitor you need either a test light or a resistor. Often times these are included with the purchase of a capacitor but can be purchased separately if necessary. A) Using a Test Light: A test light is the simplest way to charge a capacitor. All you need to do is take the power and ground of the test light and stick them in-line where your fuse used to be. You can use alligator clips to simplify this process. Hold the test light in place of the fuse until the light bulb turns off meaning the voltage went from 12V to 0V and the capacitor is charged. B) Using a Resistor: You will need a 1 watt, 30 – 1,000 Ohm (1kohm) resistor for charging your capacitor unless otherwise specified (you capacitor may have a resistor included). Try to use a higher impedance resistor so that the capacitor is charged slowly. This will prevent the capacitor from charging too fast and sustaining damage. Also, a lower wattage resistor will heat up very quickly and could crack or explode so make sure NEVER to hold a resistor with your bare hands. Put the resistor in line with your fuse holder, as though it were the fuse. Place the voltmeter positive node on the positive terminals of the capacitor and the negative node on the ground terminal of the capacitor and set the meter to Volts DC. Once the volt meter reads 11 or 12 volts you can remove the voltmeter and replace the resistor with the power fuse. The fuse may spark when you reinstall it, this is normal and should end quickly. Regardless of which charging method you use, the results will end up being the same. Some capacitors come with a charging card that is attached to the posts of the capacitor and acts like a resistor or test light. Follow the instructions provided when using a charging card. Remember when installing any electrical equipment that you need to remove the negative terminal of the battery or the fuse in-line with the power wire connecting to the battery. In this situation, the fuse in-line with your power wire will need to be removed. For information on how to discharge a capacitor, view our article titled “How to Discharge a Capacitor“.